Basic Books, New York: 1997. Hardcover with dustjacklet. Good condition. 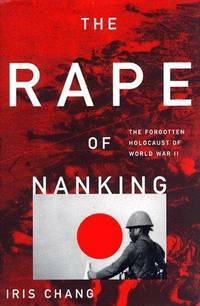 Tells the story of the brutal massacres of more than 300,000 Chinese in China from three perspectives: that of the Japanese soldiers who performed it; of the Chinese civilians who endured it; and finally a group of Europeans and Americans who refused to abandon the city and were able to create a safety zone that saved almost 300,000 Chinese. Includes an Index. "Meticulously researched . . . A gripping account that holds the reader's attention from beginning to end." -- Nien Cheng, author of Life and Death in Shanghai ISBN: 0465068359.